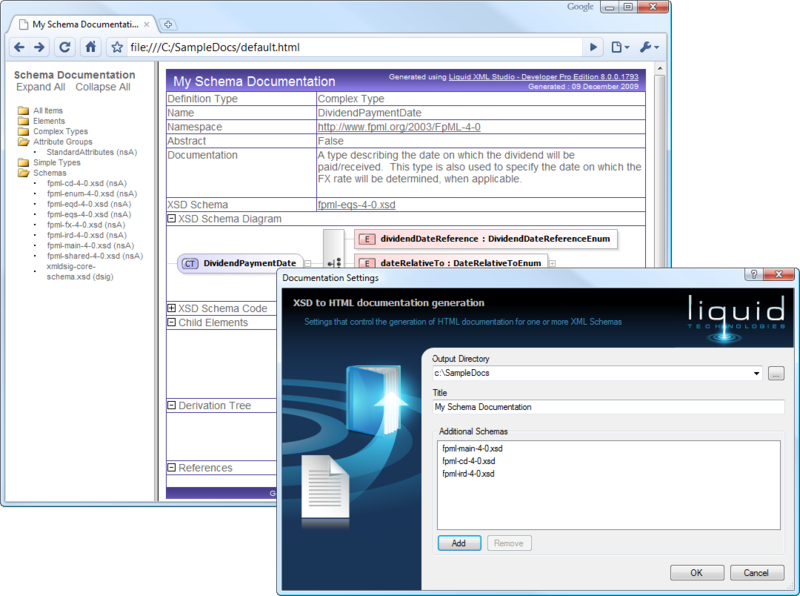 The XML Schema Documentation tool creates PDF, HTML or ASP.Net documentation from an XSD. Having high quality documentation for your XML Schemas makes it easier to understand, and allows it to be shared more easily between groups of developers and analysts. The generated documentation contains the original schema code, diagrams, detailed properties, type hierarchy, annotations and references to all uses. Clicking on items in the schema diagram will drill down into the selected item, making navigation simple. All the sections are collapsible, making it possible to ignore information you are not interested in. Customizable, the HTML or ASP.Net site can be customized making it easy to integrate with your own web site. You can even use your own XSLT templates. Example XSD documentation can be seen on the XSD Library Web Site. The XML Standard Library Web Site was created using the XML Schema Documentation tool, and includes large industry standard schema.